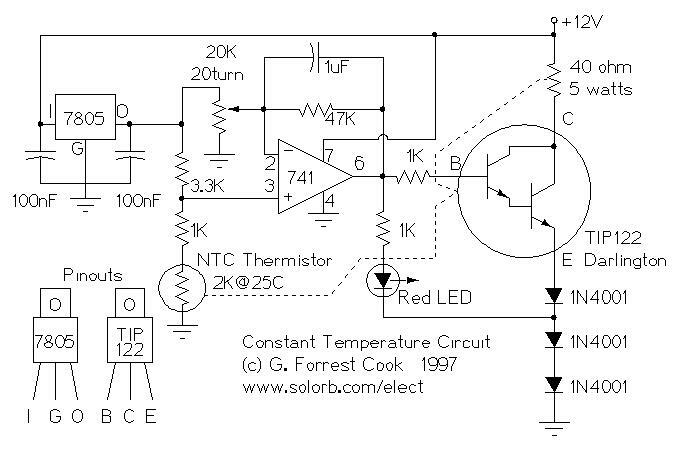 Description: This circuit is a generic low power temperature controller that can be used for stabilizing temperature sensitive electronic circuits. It was built to stabilize a radio frequency VFO (Variable Frequency Oscillator) for ham radio applications. The circuit has also been used to lower the drift of a Ramsey FM10a micropower FM transmitter. The 7805 voltage regulator provides a reference voltage that is fed into a resistive bridge formed on one side by the 20K trimmer and the other side by the 3.3K resistor and the 1K/thermistor combination. The termistor is an NTC (Negative Temperature Coefficient) type. The op-amp is run in a differential mode and tries to keep its inputs at the same potential by the thermal feedback loop formed by the heater and the thermistor. The three 1N4001 diodes are used to bias the emitter of the transistor up enough that it can shut off fully with the limited voltage swing from the 741 op-amp. The heating indicator LED (a standard red LED) also taps off of the same diode ladder to enable it to shut off entirely. The value of the (1uF) capacitor in the op-amp feedback loop may need to be adjusted if the circuit "rings", or swings back and forth before stabilizing on a temperature. The heater resistor is rated at approximately 40 ohms and 5 watts. The value of the resistor determines the heating rate and the power consumption. The resistor value should not be too low or the resulting high current will damage the 1N4001 diodes and/or the TIP122 transistor. I recommend building this circuit on perforated circuit board or make a PC board if you have the tools. I epoxied the thermistor and all of the heat generating components (the 40 ohm resistor, the TIP122, and the 3 1N4001 diodes) on an L shaped aluminum piece, the rest of the components were mounted on a perforated circuit board. The circuit board was then mounted on the aluminum piece with standoffs. The mounting tab of the TIP122 is electrically hot, it should be isolated from the heat sink with an insulating washer, or the entire heat sink should be isolated from ground. Use heat conducting grease when mounting the transistor on the heat sink. Also be sure that the thermistor has a good thermal contact with the 40 ohm resistor. The 78L05 regulator's mounting tab does not require a heat sink, it should not be electrically isolated from the TIP122 tab. The 40 ohm resistor and TIP122 heat sink should be mounted near the item that is to be temperature controlled. I recommend using forming a box of styrofoam insulation around the temperature regulator and the temperature controlled device. The insulated box will reduce power consumption, speed up the initial warm up period, and stabilize the temperature from external changes. Adjust the 20K pot to center and power up the circuit. The LED should start out bright, then gradually dim down as the circuit reaches equillibrium. Put a thermometer on the 40 ohm resistor and measure the temperature. Adjust the 20K pot until the resistor reaches the temperature that you desire. If the circuit is properly built, it should not oscillate. The voltage on the 741 op-amp output (pin 6) can be monitored with a volt meter to observe the circuit's operation. Apply power to the circuit, let all of the components warm up. The heating resistor will stabilize at a constant temperature.